As researchers investigate vaccines to prevent Alzheimer’s disease and continue to research new drugs, local medical professionals stress there is no cure. Prevention starts early and continues through all stages of life, but sometimes that isn’t even enough to combat the most common form of dementia, which affects 5.7 million Americans. One study, out of Florida Atlantic University, has concluded that sarcopenic obesity—the “skinny fat” combination of low muscle mass and high fat—may lead to cognitive decline more than any other body type. This condition is associated with the lowest performance on global cognition tests and executive brain functions such as working memory, mental flexibility, self-control and orientation. In addition to sarcopenic obesity, the study’s researchers assessed the relationship between performance on various cognition tests and three other body types—normal weight, muscle and fat; sarcopenia, loss of muscle tissue as part of the aging process; and obesity, considered 20 times more than recommended weight. People in the normal range had the best cognition, while those with sarcopenia or obesity fell in the middle. While sarcopenia starves the brain of nutrients and fat delivers toxins, it’s the combination of both conditions that can be so devastating, according to the study, resulting from analysis of 353 New York City patients with an average age of 69. 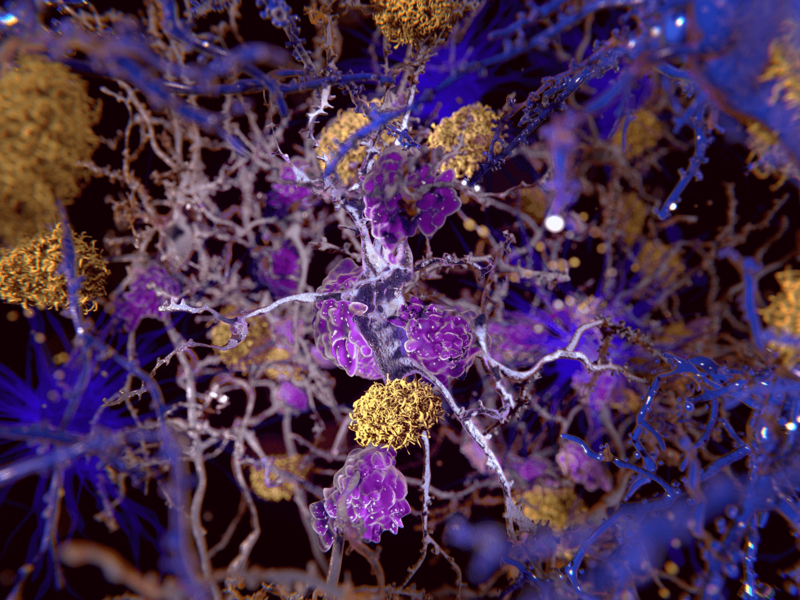 The cause of between 60 percent to 80 percent of all dementia cases, Alzheimer’s is characterized by protein deposits called plaques that build up in spaces between nerve cells, and tangled, twisted protein fibers that build up inside cells, according to the Alzheimer’s Association. The two other most prevalent types of dementia are vascular dementia, caused by inadequate blood flow that kills brain cells, and dementia with Lewy bodies, characterized by abnormal protein deposits that change brain chemicals. Other causes include Parkinson’s disease, diabetes, chronic head injuries and stroke. Lifestyle also can play a role in brain health. Drivers on Interstate 95 between Fort Lauderdale and Miami might have seen billboards of disfigured bodies warning that “Syphilis Is Serious.” In later stages, the STD also can cause scarring, infection and inflammation in the brain’s lining. Preliminary results suggest that intensive blood pressure control significantly lowered increases in cerebral white matter abnormalities that were detected by magnetic resonance imaging among a subgroup of the study’s participants without diabetes. Yet someone could have a high-protein diet, run marathons, finish a book a week, and still see mental decline. “The more demented, the closer we are to pollution—that’s just intriguing,” says John Harris, a neurologist at Boca Raton Regional Hospital’s Marcus Neuroscience Institute. He’s referring to a study conducted by three colleges in London, which found that people in the areas most polluted with nitrogen dioxide were 40 percent more likely to have been diagnosed with dementia. People in the areas most polluted with particulate matter from traffic were 26 percent more likely to have been diagnosed with dementia. Ounce of Prevention: In the absence of a cure for Alzheimer’s disease, health care professionals encourage people to eat a healthy and nonprocessed diet, develop brain-nourishing muscle through aerobic and anaerobic exercise, and reduce body fat. In order to lower the risk of developing dementia, it’s especially critical to avoid being “skinny fat”—the presence of more fat than muscle. Just as important is lifelong learning and positive relationships that produce endorphins and encourage neuroplasticity. The Working Women’s Leads Group, a networking initiative under the auspices of the Fort Lauderdale Chamber of Commerce, echoes the message. As the group celebrates its first anniversary, many women in health care are joining for professional and personal development.